Having harboured the idea for twenty years, Mike Scott set twenty W.B. Yeats poems to music in an enterprise that evolved into a show entitled ‘An Appointment With Mr. Yeats.’ The Waterboys held the world premiere from 15 to 20 March 2010 in Yeats’s own theatre, The Abbey Theatre, Dublin. The five-night show quickly sold out, later receiving several rave reviews, among which were The Irish Times and Irish Actor/Playwright, Michael Harding. The performances boasted an eclectic mix of musicians that involved Irish rock singer Katie Kim, Irish singer/writer/guitarist Joe Chester and Simon Wallace (keyboards). Some of the poems performed include ‘The Hosting of the Sidhe,’ ‘The Lake Isle of Innisfree,’ ‘News for the Delphic Oracle,’ and ‘The Song of Wandering Aengus,’ along with an amalgamation of two Yeats lyrics that became the song ‘Let the Earth Bear Witness’ which Scott had produced during ‘The Sea of Green’ 2009 Iranian election protests. The musical arrangements for the poems were varied and experimental. 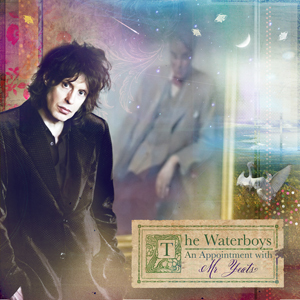 On the band’s website Scott described the arrangements as “psychedelic, intense, kaleidoscopic, a mix of rock, folk and faery music,” the delivery of which signals yet another musical shift in the ever mutable world of The Waterboys. ‘An Appointment With Mr. Yeats’ returned to Dublin on 7 November 2010 in the city’s Grand Canal Theatre. The show was performed at the Barbican Hall, London in February 2011. The album version of ‘An Appointment With Mr Yeats’ was released to critical acclaim on the 19th September 2011.